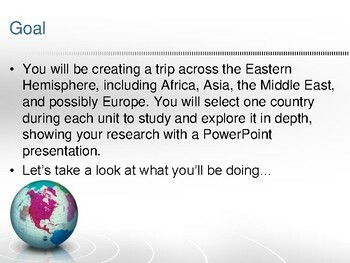 A PowerPoint presentation which guides students to research and present information an any country in the world. 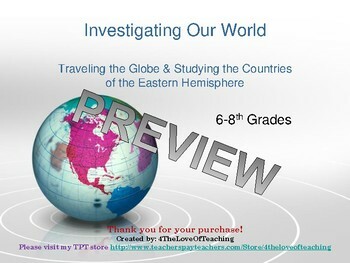 Includes geography, mapping, poetry, and math with informational graphing. This resource is completely editable so you can customize it for your classroom needs! I am using this for my 7th grade Eastern Hemisphere class, but it can be used with any country or location. For each unit we study, students will choose one country from that area to do more in-depth research. They will then present their information to the class using this PowerPoint format. By the end of the year, each student will have created four separate presentations - 1 per quarter. 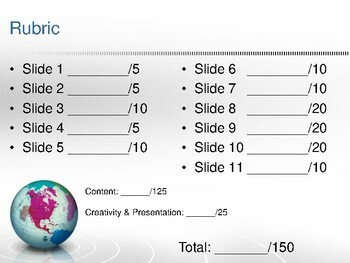 A rubric is attached as part of the slideshow. Once downloaded, you may edit the information or requirements to fit your needs. Thank you for your purchase!